Designed for everyday use, the Peugeot electric pepper mill reinvents an iconic movement by making it simpler, more efficient and faster, without sacrificing on style. 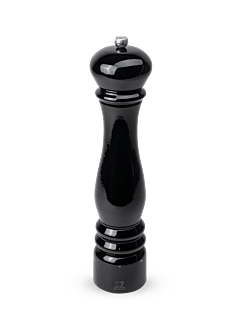 Electric pepper mill in ABS grey quartz 17 cm - 7 in. 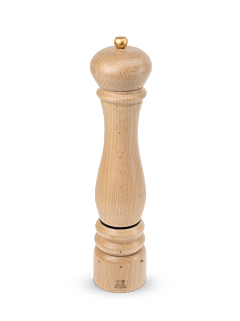 Suitable for all types of pepper, the Peugeot electric pepper mill is functional and aesthetic. With its understated but ultra-contemporary lines, it is available in black, a stainless steel finish or in coloured versions, to dress the most sophisticated interiors, from the kitchen to the most beautiful dining tables. The Peugeot rechargeable or battery-powered electric pepper mill is a must for lovers of flavour for whom efficiency, simplicity and speed are also essential aspects of fine cuisine. The Peugeot electric pepper mill offers optimal comfort: activated by a single touch and requiring just one hand to operate it, carry on cooking while grinding. In addition, it created a constant amount of pepper, elevating all dishes, from the simplest to the most sophisticated, in a controlled and homogeneous manner. The grind can be adjusted, with the dial located under the mechanism to reveal the full intensity of the aromas of the pepper. The finer the grind, the more its spicy notes will be revealed, the diversity of its flavours becoming more discreet. When ground coarse, it will flavour dishes with less intensity but will deploy a varied and complex aromatic palette.